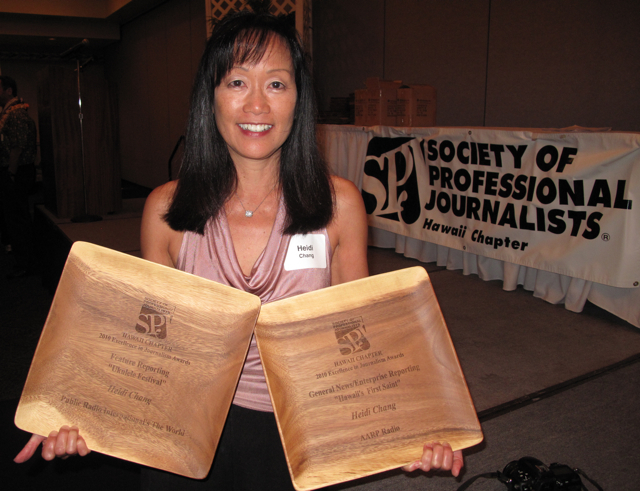 EWC media alumna and multimedia journalist, Heidi Chang (Hong Kong Journalism Fellow 2003), recently won the two highest honors for radio news and feature reporting from the Society of Professional Journalists Hawaii Chapter. Hawaii’s journalism community turned out to celebrate some of its best work produced statewide at its annual Excellence in Journalism Awards dinner in Honolulu on June 24, 2011. The awards recognized work produced in 2010. Heidi is currently working on an oral history project with the Hawaii Council for the Humanities to help preserve the legacy of some of the last remaining patients in Kalaupapa. If you’re interested in collaborating or contributing in some way, please contact Heidi at: Heidi@HeidiChang.com. This entry was posted in Uncategorized and tagged hawaii council for humanities, Hawaii ukulele festival, Heidi Chang, society professional journalists hawaii. Bookmark the permalink.